Ms. Sylvia Fang (above photo) joined Taiwan Semiconductor Manufacturing Co Ltd (TSMC) about two decades ago and is the third General Counsel of the company. 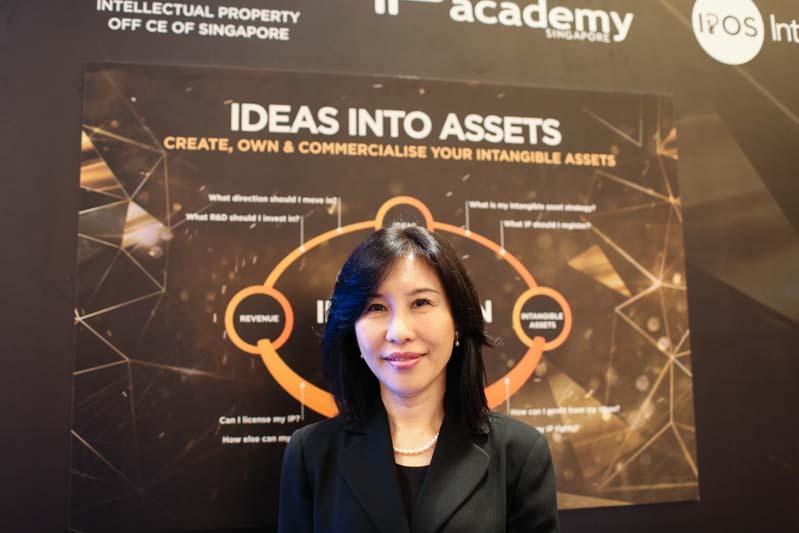 Currently the leader of the legal team at TSMC, Ms. Fang was an invited speaker at the IP Week@SG 2017 organised by the Intellectual Property Office of Singapore (IPOS). OpenGov had the opportunity to speak to her at the event and learn more about her work, challenges and risks in her role at TSMC. Could you tell us more about your role as VP, Legal and General Counsel at TSMC? TSMC is the world’s largest semiconductor foundry and globally, we have over 48,000 employees. As the VP and General Counsel, even though I’m in-charge of legal organisation, I’m deemed as one of the management team members. At TSMC, we have a management committee that is composed of the chairman, 2 co-CEOS, CFO and General Counsel. As General Counsel of the company, I’m in-charge of legal organisation but also involved in major business decisions too. So I have to rely on my people for detailed legal matters but I am also a lawyer by training. At TSMC, we have very high standards of ethics and part of it is to comply with all the laws and regulations in jurisdictions where we have business operations. So that’s the reason why the Chief Legal Officer who is also the General Counsel of the company is also part of the management team. It’s part of the culture of the company that tries our best to comply with laws and regulations. As the leader of the legal team at TSMC, are there any areas you are looking to expand or improve upon? The team is composed of many experts from 3 areas – firstly, Intellectual Property (IP), secondly, corporate compliance and the thirdly, commercial transactions. These are three pillars of the organisation. I think we have seen more and more challenges in the areas of IP and regulatory compliance too. So if you ask me which areas we may need to expand the team or expertise, these would be in IP and regulatory compliance. For technology companies like TSMC, IP is certainly a very important area – we don’t just build our own IP portfolio, we also need to face the challenges from outside. Say for example, the Non Practicing Entities (NPEs) or some may call them patent trolls, is one of the most prominent situations. Like it or not, it is one of the challenges we have to deal with. For regulatory compliance, because TSMC’s operations are global – we are based in Taiwan but we have some factories in the US, China and also a joint venture fab in Singapore too. We also have business presence and subsidaries in North America, Canada, Europe, China, Japan and Korea. Our operations is global and we need to make sure that we are able to comply with all the laws and regulations where we have business presence. Because there are more and more requirements coming out of the compliance areas, we need to pay a lot of attention and spend a lot of effort to ensure compliance with all the laws and regulations. In your experience, how do you think the semiconductor industry value chain has evolved in the last 5-10 years? How have different IP regimes evolved? The semiconductor industry has evolved a lot and I’ve been in this industry for over 20 years and actually TSMC plays a very special role in the development of the semiconductor industry. Before TSMC, the semiconductor industry is mainly composed of Integrated Device Manufacturing companies (IDMs). These IDMs are companies like TI (Texas Instruments) and Intel, they do their own circuit designs and they manufacture their own designs, they have their own products and brand names. And there are very few companies, nowadays we call it fabless, meaning companies that do not have any manufacturing abilities, they don’t have any fab, they just do their own design. In the past, before TSMC, companies like Intel and TI do manufacturing for them but these IDMS only do manufacturing for fabless companies when they have additional capacity in their fabs. There are very limited number of IDMs before TSMC but after TSMC’s establishment 30 years ago, we actually helped to change the semiconductor industry. So nowadays you see more than a thousand fabless companies – TSMC, we have close to 500 active customers, most of them are fabless companies, such as Qualcomm and Nvidia, they don’t have their own manufacturing facility. The existence of TSMC means a lot to them because semiconductor manufacturing companies have to make a lot of capital investment to build capacity. Take TSMC as an example, we have been spending approximately US$10 billion dollars a year in capital expenditure. The costs of entry will be very high in order to build manufacturing facilities but with the existence of TSMC, people who have very good ideas of making their own circuit design, the entry level will be very low because you don’t need to invest in the manufacturing capacity. They can hand over their design to TSMC for manufacturing. After the establishment of TSMC, the whole semiconductor industry just changed. In the past, there were only very few fabless companies but after our establishment, there are just a lot of fabless companies who entered the industry. TSMC is in the pure foundry business, we don’t do any circuit design, we just do manufacturing for our customers so we don’t compete with them. So customers can feel very comfortable to trust their products with TSMC. There are a lot of other companies who want to move to this area, even IDMs such as Intel or Samsung, they also want to participate in this semiconductor foundry business. At the beginning of our business, it was much simpler but over the years, along with the development of relationships with certain customers, the business models also become more complicated- that poses some additional challenges for our commercial transactions team within the organisation. Along with the growth of the complications with business transactions, there are additional legal risks that we need to pay attention to. What are the other challenges or risks that TSMC face with the development of the semiconductor industry? With the evolution of the semiconductor industry, our relationship with the customers also changed a lot – we have been trying to provide more services to our customers. For example, we provide customers with pre-designed circuit elements to enable those customers to speed up their design process, thus shortening the time to market for the customers&apos; products. Within the semiconductor industry, the pre-designed circuit elements are called "Intellectual Property" or "IP" because the companies providing the pre-designed circuit elements make their money by licensing the copyrights or patents associated with the circuit elements. TSMC, and many of our competitors, try to develop a design "ecosystem" to support their customers. A design ecosystem consists of several companies that provide IP that is compatible with a foundry&apos;s manufacturing services. It is beneficial for a foundry to provide as extensive ecosystem as possible because a larger ecosystem provides more design options to help customers reduce their time to market. Customers are not required to use the IP provided by TSMC or commercial IP providers, but as a practical matter small companies that don&apos;t have the resources to support a large in-house design team have to rely on the IP provided by TSMC or the ecosystem. Since TSMC is the largest foundry, IP companies are very eager to be admitted to TSMC&apos;s ecosystem in order to have access to TSMC&apos;s customer base. The additional risks will come along with these kind of new services. You mentioned about Non Practicing Entities (NPEs) at the start, so could you tell us more? I think for people dealing with IP matters, they must be very familiar with this new challenge. NPEs who don’t have their own operations but they mainly acquire their patent portfolios then they enforce and assert these patent portfolios against operating companies like TSMC. And there are quite a few of these NPEs, especially in the US. And the US is a very important market for most of the companies. So it’s one of the biggest challenges faced by technology companies.